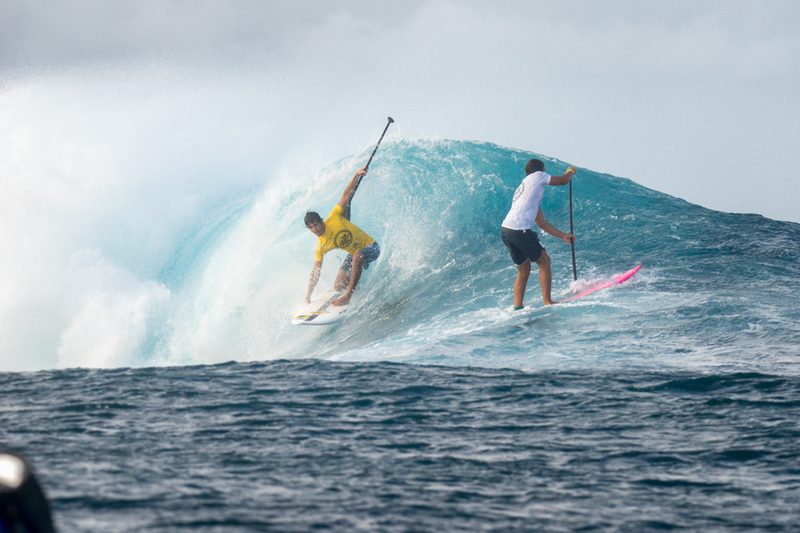 In 10′ swells and fierce winds, the world’s best SUP Surfers met on center stage at Fiji’s Cloudbreak to create an epic finale for the Men’s and Women’s SUP Surfing competition at this year’s 2016 Fiji ISA World SUP and Paddleboard Championship. The much anticipated swell had been looming all week, prompting event organizers to reschedule the SUP Surfing Final event to Saturday to capitalize on the Fijian Island’s legendary surf spot, Cloudbreak. The support of nations was with the men’s top competitors as Mo Freitas from Hawaii, Giorgio Gomez of Team USA and Zane Schweitzer from Team Hawaii sized up the surf at Cloudbreak for their Final event. 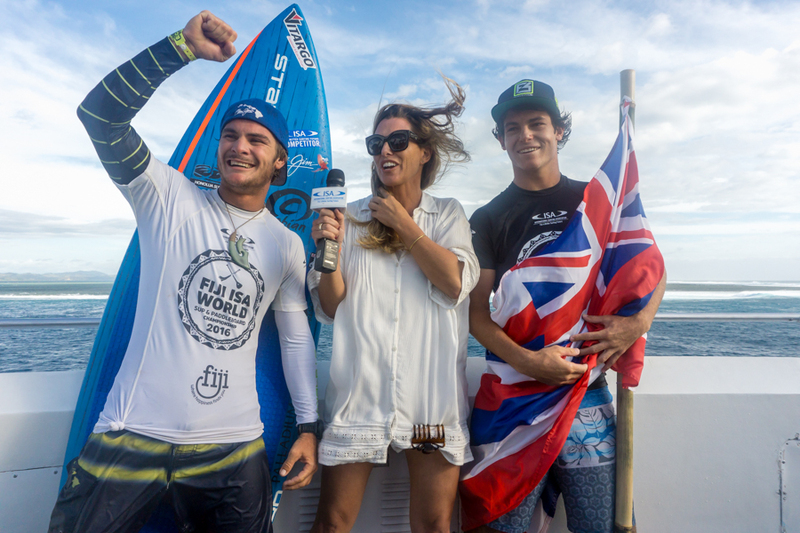 It was to be an epic battle among the best in the business in heavy swells on a shallow reef in front of an international community. In a thrilling finale, with the scores closely tied and the minutes ticking down, Sweitzer grabbed one last wave in the final seconds of the round, pulled into a barrel to the roar of the crowd and carved the wave all the way to the inside with solid turns and a stellar performance. That final wave awarded him a score of 9.0 catapulting him from third place into first and awarding him and Team Hawaii another Gold medal. Mo Freitas finished a strong second with a close score of 15.07 points to Schweitzer’s 15.70 and was awarded the Silver medal for Team Hawaii. USA’s Giorgio Gomez brought home the Bronze to a solid score of 14.77 making this Men’s SUP Surf Final an event to remember. The Women’s SUP Surf finale was no less exciting as the women took to the surf with skill, confidence and double-dare-you risk taking in the giant surf. Double overhead waves, and a strong wind did little to hinder these athletes from putting on gutsy performances, once again reminding the world stage that women’s SUP surfing is every bit as competitive as the men’s. In this thrilling Women’s SUP Surfing Final, Australia’s Shakira Westdorp triumphantly rose to the top of the podium and was crowned 2016 Women’s World SUP Surfing Champion. Westdorp’s hard fought efforts earned her podium finishes in ISA World Championship’s 2012 – 2014 where she was,, in the end, unable to claim her victory. This year’s win tasted extra sweet for the the Aussie as her dominant strength and supreme performance, at long last, earned her the Gold medal for Team Australia. 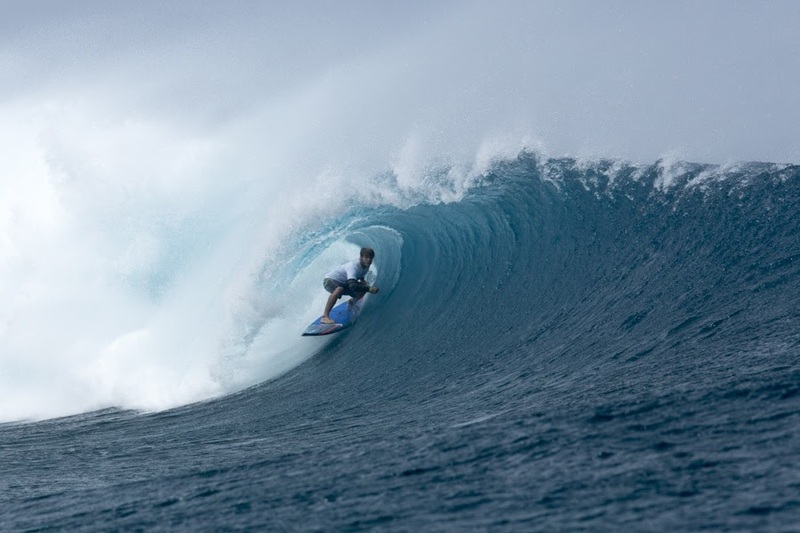 The defending Gold Medalist, USA’s Izzi Gomez, put on an admirable Silver Medal performance, riding a few enormous waves over Cloudbreak’s shallow reef. Peru’s Brissa Malaga earned the Bronze Medal. For more highlights from the 2016 Fiji World SUP and Paddleboard Championships, see recap from Distance Races and Technical Races.